Hall of the Mountain King: Review: "Alice Cooper, Volume I: Welcome to My Nightmare"
Review: "Alice Cooper, Volume I: Welcome to My Nightmare"
Editor's Note: Normally, I keep my music writings and book writings separate, but I thought this would have some crossover appeal, so I'm sharing here, as well. Enjoy. Though I was at one time an avid comic collector and reader, and I’m a lifelong fan of hard rock and metal, I had never read the Alice Cooper comic series. 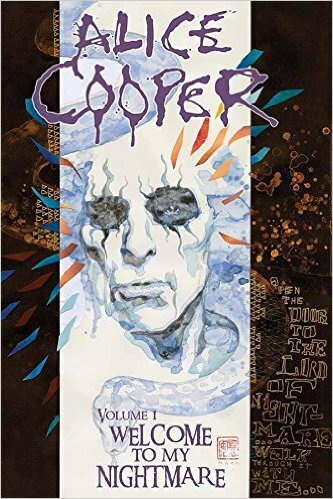 Recently, a co-worker, knowing my proclivities for both comics and rock, gifted me with “Alice Cooper, Volume I: Welcome to my Nightmare” ($24.99, Dynamite). The first thing that struck me about this collection was that it was a gorgeous presentation. The hardcover collects the first six issues of the Dynamite Alice Cooper comic, along with a bonus featuring Alice’s first comics appearance with Marvel in the 1970s. The story arc of the newer comics features Alice as the Lord of Nightmares. Trapped in a bad contract by a trio of devilish agents known as Clan Black, he has fallen into obscurity. That is, until a young man who is being bullied discovers Alice’s music and accidentally summons him from the Nightmare Place for help, freeing him from his contract with Lucius Black, but opening Alice and the young man, Robbie, up to danger from the other two members of the clan. As comic stories go, this one isn’t the most compelling that I’ve ever read. It’s far more Saturday-morning cartoonish than dark and sinister, but in a way, that also fits Alice’s personality. The artwork, however, is fantastic and easily makes up for any weaknesses in the storyline. That kept me turning the page to see what bleak landscape or fascinating demon was coming next. There’s certainly a lot of fun to be had here between Alice, his snake Kachina, and his manservant Aemon Price, who bears a striking, if not surprising, resemblance to the late, great horror actor Vincent Price. There are also plenty of inside jokes in both the text and art that fans of Alice will enjoy. The book ends very old school, with Alice’s first comics appearance in Marvel Premiere No. 50 from 1979. It is, naturally, drastically different from the six volumes that come before. Based on Alice’s album From the Inside, it tells the story of the shock rocker heading to rehab before he is mistaken for Alex Cooper, who is headed to an insane asylum. Like the album, it follows his experience in the looney bin and the colorful cast of characters there. All in all, “Alice Cooper Volume I” was a fun read with some great artwork. I don’t know that it convinced me to explore the Dynamite comic further, but it’s a nice addition to my collection and will look great on the shelf. The final page of the book, though, teases the Neil Gaiman adaptation of Alice’s The Last Temptation, also coming in hardback. If anyone would like to gift me with that, it would be most welcome.